Sir Roland de Velville (1471/4 - 25 June 1535, also Vielleville, Veleville, or Vieilleville) is alternatively presented as the clear "illegitimate issue" (son) of King Henry VII of England by "a Breton lady whose name is not known", or as a favoured member of the court of Henry VII and later recipient of beneficences, brought home to England with 28-year-old Henry after his exile in Brittany, an adolescent "of unknown parentage", and so a possible or likely illegitimate son, with formal historical opinion undecided. It appears that Velville is a French translation of the Breton name, Cosquer (sa maison appellée en langue bretonne du Cosquer, ou de la Vieuxville en langue françoise, Archives Départementales des Côtes d'Armor - 2 E 422 Famille Lanloup, Kerbouric (de), p. 2). The Breton for 'old' ('vieille' or 'vieux' in French) is 'cos' or 'coz' and the Breton for 'village manor' or 'village' ('ville' in French) is 'ker' - sometimes spelled 'quer' or 'kaer' historically. The Cosquer (also sometimes Coasker or variants of) family lived at the Château de Rosanbo, near Lanvellec, Brittany, and their descendants in the female line, the Marquises of Rosanbo, still live there today. [circular reference] The coat of arms of this family is D'or au sanglier passant de sable (Or [gold], a boar passant sable [black]), which were contemporaneously attributed to Roland de Velville. A Roland de Cosquer was recorded in Caouënnec-Lanvézéac in 1426. This says that in 1476 the manor of Cosquer was held by Yvon de Quélen, who was probably the daughter of Typhaine de Quélenec, daughter of the viscount of Fou en Rosnoën. In his 'Henry VII: The Maligned Tudor King' (Amberley Publishing, 2016), Tony Breverton notes that Henry Tudor, when he first arrived in Brittany, was in the care of Jean de Quélenec, Viscount of Faou. This points to a possible derivation of the name Velville; namely, that Roland de Velville's mother was a relation of the Jean de Quélenec, Viscount of Faou, and took his name from their manor of Cosquer. Thus, this circumstantial evidence points to a possible relationship with the de Quélen and de Quélenec families, whereas the heraldic evidence (the boar passant sable) points to the family of Cosquer of Rosanbo (see above), but these families might have been connected. On voit aussi Pierre de la Vieuville qualifié chevalier banneret dans une montre du 14 septembre 1413. Nous ne croyons pas que ce seigneur appartienne à la famille de la Vieuville de Bretagne, ancienne, il est vrai, mais peu richement possessionnée. Il est plus sûr de l'attribuer à une famille du même nom et considérable de l'Artois, dont les armes sont fascées d'or et d'azur, et à laquelle appartenaient Jean et André de la Vieuville, chevaliers en 1377, et peut-être aussi Jean de la Vieuville, chevalier de l'ordre du roi et bailli de Gisors en 1498. La famille de la Vieuville de Bretagne est distincte de celle du Cosquer ou du Coskaër, qui, à la fin du XVème siècle, francisa son nom en le changeant en celui de la Vieuville. - Il a existé en Bourgogne, selon Olivier de La Marche, une ancienne famille de bannerets, appelée de la Vieuville. Pierre de la Vieuville aurait pu aussi appartenir à une famille de Bourgogne du même nom, qui possédait au XVème siècle le fief de bannière de la Vieuville. See also Etienne Pattou, Guillaume de La Vieu(x)ville & autres familles de La Vieuville, La Viefville, etc. (racineshistoire.free.fr/LGN/PDF/La-Vieuville.pdf, accessed 7/3/2018). Peter Beauclerk-Dewar and Roger Powell note that while not having official position or office, de Velville was a courtier and "favourite of the king, participating in numerous jousts and accompanying the king out hunting." He saw military service in Brittany in 1489, and likely in France with the King in 1492, was knighted in 1497 after the Battle of Blackheath, and was one of a small group of knights individually rewarded for their efforts by Henry VII. Beauclerk-Dewar and Powell further state that historical records regularly place de Velville at royal tournaments marking significant royal events (marriages, visits of foreign monarchs) of the Court of Henry VII, in particular his jousts, from 1494-1507; in May 1509 he was appointed to attend Henry VII's funeral as a knight of the Royal Household, and in June to participate in the royal jousts in celebration of the accession of Henry VIII. Shortly thereafter, he was appointed Constable and Captain of Beaumaris Castle, Anglesey (Ynys Môn, in Wales) in 1509, a position he held until his death. Historian Alison Weir notes "he married a Welshwoman, and had issue" [i.e., a child or children]. His wife Agnes (née Griffith), was widow of Robert Dowdyng and daughter in the powerful Welsh family of William (Gwilym) Griffith Fychan and so brother to Sir William Griffith, a Chamberlain of North Wales; Agnes gave him two daughters, Grace and Jane, the latter who, in marriage to Tudor ap Robert Vychan, gave birth to Katherine Tudor, in Welsh Catrin o Ferain (who is sometimes referred to as "the mother of Wales"). de Velville died on 25 June 1535, cause unknown, and was buried in the Chapel of the Blessed Virgin Mary in Beaumaris. Bwrw at Sr Rplant Brytaen . . .
Sir Roland of Brittany was your ancestor . . .
A gentle peacock who was the kinsman of the stags of Penmynydd. Of a line near to the crown and of its blood. 5) Velville was referred to as a man of a kingly line in an elegy composed on his death in 1535 by the Anglesey bard, Dafydd Alaw (quoted (in Welsh) in D. C. Jones, The Bulkeleys of Beaumaris. 1440-1547, Anglesey Antiquarian Society and Field Club Transactions (1961 ), p. 8). The quotation also refers to Velville as of earl's blood (...gwr o lin brenhinoedd ag o waed ieirll i gyd oedd,), which, assuming an allusion to Tudor ancestry is intended, presumably refers to Henry VII's father, Edmund Tudor (d. 1456), Earl of Richmond, though Henry VII was Earl of Richmond from birth, being born posthumously. The assertion by Professor Chrimes (see Henry VII of England) that the 'allegation' of Velville's royal paternity was originally made in 1833 by that enthusiastic but frequently inaccurate amateur historian of Anglesey, Angharad Llwyd (Professor S. B. Chrimes, Sir Roland de Veleville, Welsh Historical Review, 1967) is therefore false. The 'assertion' was current during Velville's lifetime, some 300 years earlier than Chrimes claimed. Sr Rowland villavile or delaville was the naturall sonne as is reported of the duke of brittaine but most authors are of opinion he was naturall sonne of hen E of Richmond whilst he was in britaine & was after H7: Paradyn makes no mention of any base sonne that the duke of Britaine had & that the duke was litle slender & black: & Sr Rowland was tale [tall] very stronge & fair much like to Kinge H8 . . . (Harley MS. 1971, 22, written either by Randle Holme I (1570/1-1655) or by Jacob Chaloner (d. 1631)). ^ a b c d e f See Peter Beauclerk-Dewar & Roger Powell, "King Henry VII (1457-1509):Roland de Velville (1474-1535)", in Royal Bastards: Illegitimate Children of the British Royal Family (Gloucestershire, U.K.: The History Press, 2008), e-book edition, pp. 177-186, ISBN 0752473166. ^ a b c Alison Weir, Britain's Royal Families: The Complete Genealogy (London, U.K.: The Bodley Head, 1999), pp. 152. ^ See Beauclerk-Dewar & Powell, pp. 177-186, citing Prof SB Chrimes, Cardiff University, and WRB Robinson, writing separately in the Welsh Historical Review, and Prof RA Griffiths and RS Thomas, University College, Swansea, in "The Making of the Tudor Dynasty" (ISBN 0750937769). ^ Cavan-Caouënnec au Moyen-Age citing H. Torchet, Réformation des Fouages évêché de Tréguier 1426-2003, Montres de l’évêché de Tréguier en 1481 par Pol Potier de Courcy, M.Nassiet, Dictionnaire des feudataires de l’évêché de Tréguier en 1481, SocECdA , tCXXVII, 1998, Montre de Tréguier en 1503, AD22 1C184 et 74J49, retranscription par Ph. Caron, http://caouennec-lanvezeac.fr/index.php/la-commune/histoire?id=91 and http://caouennec-lanvezeac.fr/index.php/la-commune/histoire?id=84, accessed 11/3/2018). Note that the last linked page says: En 1476, le Cosquer est à Yvon de Quélen, probablement le fils de Conan IV de Quélen et de Typhaine de Quélenec (fille du vicomte du Fou en Rosnoën), sire de Quélen, baron du Vieux-Chastel; Yvon se marie à Jeanne de Kerimerch, puis le 26 février 1450 à Jeanne du Chastel. ^ John Ballinger, "Katheryn of Berain", Y Cymmrodon, Vol. XL, The Honourable Society of Cymmrodian, London, 1929, see , accessed 22 June 2014. Brittany is a cultural region in the northwest of France, covering the western part of what was known as Armorica during the period of Roman occupation. It became an independent kingdom and then a duchy before being united with the Kingdom of France in 1532 as a province governed as if it were a separate nation under the crown. The now-extinct title of Earl of Richmond was created many times in the Peerage of England. 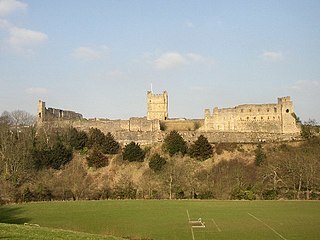 The earldom of Richmond was initially held by various Breton nobles associated with the Ducal crown of Brittany; sometimes the holder was the Breton Duke himself, including one member of the cadet branch of the French Capetian dynasty. 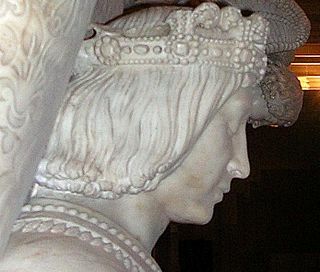 The historical ties between the Ducal crown of Brittany and this English Earldom were maintained ceremonially by the Breton dukes even after England ceased to recognize the Breton Dukes as Earls of England and those dukes rendered homage to the King of France, rather than the English crown. It was then held either by members of the English royal families of Plantagenet and Tudor, or English nobles closely associated with the English crown. It was eventually merged into the English crown during the reign of Henry VII and has been recreated as a Dukedom. Katheryn of Berain, sometimes called Mam Cymru, was a Welsh noblewoman noted for her four marriages and her extensive network of descendants and relations. Anatole le Braz, the "Bard of Brittany", was a Breton poet, folklore collector and translator. He was highly regarded amongst both European and American scholars, and known for his warmth and charm. The former Breton and French diocese of Tréguier existed in Lower Brittany from about the sixth century, or later, to the French Revolution. Its see was at Tréguier, in the modern department of Côtes-d'Armor. Tréguier Cathedral is a Roman Catholic church and former cathedral in Tréguier, Côtes-d'Armor, France. It is dedicated to Saint Tudwal. The church was formerly the seat of the Bishopric of Tréguier, abolished under the Concordat of 1801, when its territories were divided between the Diocese of Quimper and the Diocese of Saint-Brieuc, known since 1852 as Saint-Brieuc-Tréguier. Trévou-Tréguignec is a commune in the Côtes-d'Armor department of Brittany in northwestern France. The Revolt of the papier timbré was an anti-fiscal revolt in the west of Ancien Régime France, during the reign of Louis XIV from April to September 1675. It was fiercest in Lower Brittany, where it took on an anti-lordly tone and became known as the revolt of the Bonnets rouges or revolt of the Torrebens. It was unleashed by an increase in taxes, including the papier timbré, needed to authenticate official documents. Arthur Le Moyne de La Borderie, was a Breton historian, regarded as a father of Brittany's historiography. La Bretagne ouvrière, paysanne et maritime was a weekly newspaper published 1935-1950 in Brittany, France. It a regional organ of the French Communist Party in Brittany. Sir Edward Woodville KG was a member of the Woodville family during the Wars of the Roses. He survived the reign of Richard III in which several of his relatives were executed in a power struggle after the death of Edward IV. Exiled with Henry Tudor, he participated in Henry's capture of the throne. He was then appointed Lord of the Isle of Wight, the last person to be given that title. Irène Frain is a French novelist, journalist, and historian. She is a founding member of the Women's Forum for the Economy and Society.